So, I’m away in Germany right now on one of my monthly international adventures. Later today we’re heading to Wolfsburg to see my friend in the internationally acclaimed stage show: The Illusionists! Interestingly, my friend, who I was working with last month in Iceland, is actually a breakdancer in the show, not one of the magicians or illusionists. But it is Friday night so there should be an opportunity to hang out with the cast and crew for some drinks after the show! The Illusionists is showing on the main stage at Cirque Nouveau – which is like a giant circus festival all month in Wolfsburg (famous for Volkswagen and also the Autostadt, where the event is held) with loads of cool circus shows and workshops on all month… So, obviously I have to go whilst I’m in the country! This week, whilst I’ve been over here in Deutschland, I’ve been wearing my productivity pants… they’re like my regular pants but I feel an overwhelming sense of guilt that I shouldn’t be taking as much holiday as I do and should actually get some work done whilst wearing them, quite useful once you get used to the chafing. 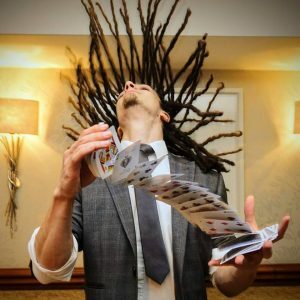 As most people who have seen me perform at an event will know I love to incorporate my business card into a trick, maybe you even have one with a drawing on the back or our names written on that switched places? My old design from 2015 and my logo, which I drew on a graphics tablet about 10 years ago has served me very well! I often had clients commenting on how someone had passed them my business card and recommended me, then when we met they exclaimed how they recognised me from the sketch on my business card and it looks just like me! But it is old, my dreadlocks are a bit longer now and it was time for something fresh! So, with my new magician logo I wanted to keep my personality and recognisability as myself but also wanted to simplify it a lot. I liked the old sketch but it was far too detailed and complex, making it very difficult to use or see at smaller sizes. A new magician logo had to keep the character and personability but be much easier to see and understand at all sizes. 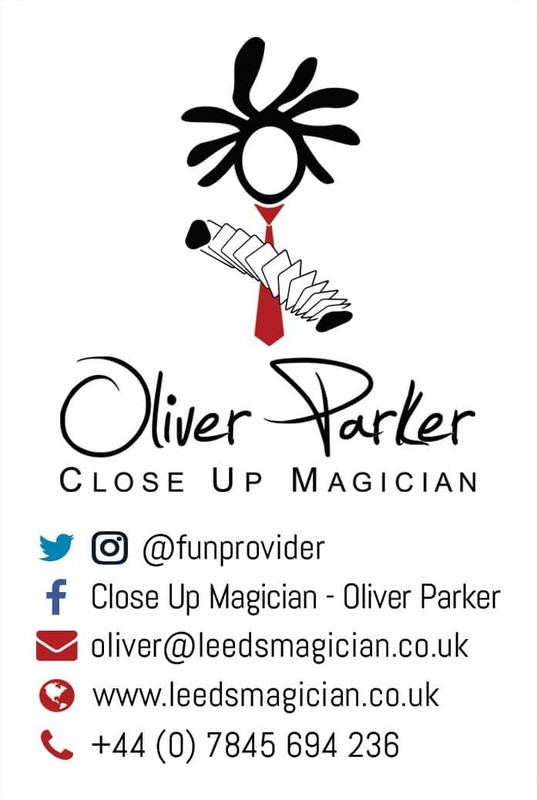 Whether used as a web icon on your smart phone for LeedsMagician.co.uk, on my Leeds Magician business card or even printed on flyers and eventually large banners for exhibiting as a wedding magician at wedding fairs. (Although my current roller banner will last a while longer and will be the only place my old logo is still present). So, I’m really happy with how the new logo looks, which I did not design myself. And quite pleased with the business card, which I did I whip up myself yesterday and have ordered for print to be delivered the day I fly back to Leeds from Germany next week! 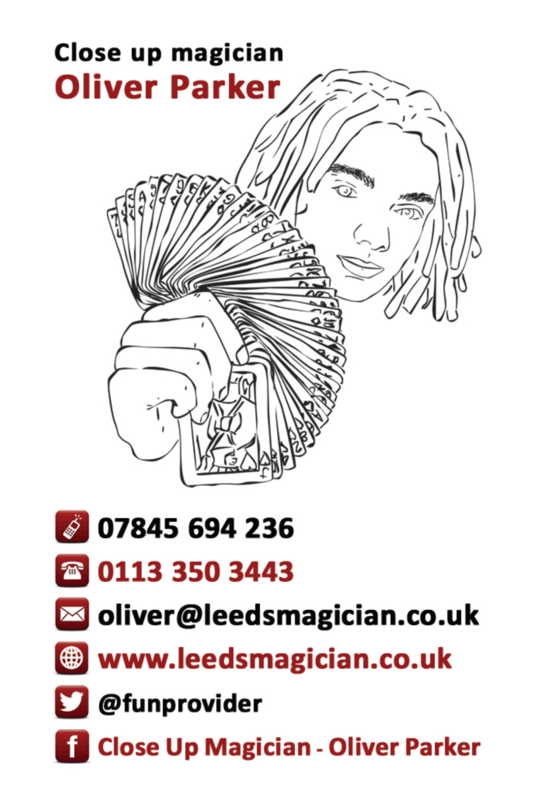 What do you think of the new Leeds Magician business card design? Please leave a comment below with your thoughts, any constructive criticism is much appreciated!